Taxi Driver. Goodfellas. Gangs of New York. It's all here. Do I amuse you? Would a painting of my fat murderous face amuse you? Yeah it would. 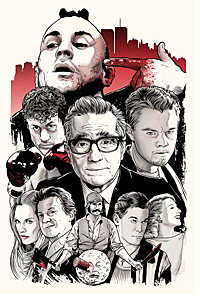 Give a hearty how-ya-doin’ to Spoke Art’s Scorsese, a pop-up tribute to the fabled director and all his iconic characters, running this weekend. Spoke’s an SF gallery specializing in zany, pop culture-inspired art (technicolor portraits of Boba Fett, collections dedicated to Wes Anderson) and for just three days they’re taking over Chelsea’s Bold Hype Gallery to bring you Scorsese-inspired works from 70+ artists. From the canon: cartoonish Five Points carnage from Gangs of New York. Pencil drawings of Boardwalk Empire’s Nucky Thompson. Screenprints of Travis Bickle’s taxi license. Plus plenty of paintings of the man himself. Early attendees will have the chance to grab a limited-edition print detailing every suit De Niro wore in Casino – 45, if anyone’s counting … or already queuing up. And Friday’s opening party is a chance to mingle with many of the artists themselves over cocktails. Might want to go home and get your shinebox.